No cleaning up necessary, just drop your models into the scene and start rendering. NOTE - The 3ds, lwo, obj and fbx-files contains only textures, no shaders. 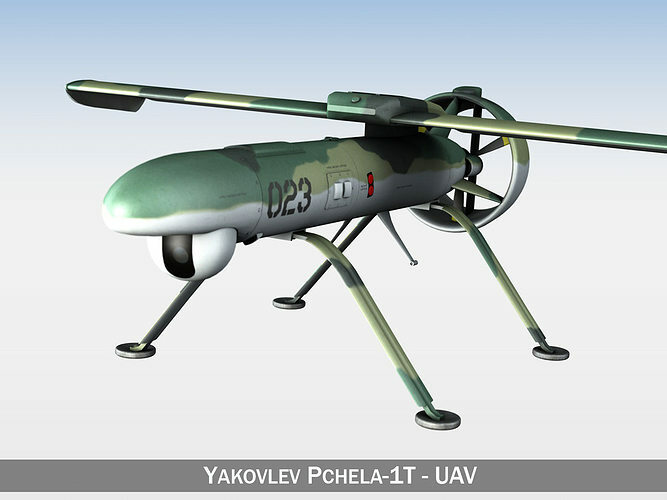 The Yakovlev Pchela-1T is a unmanned aerial vehilce (UAV) manufactured by the Russian Yakovlev Design Bureau. Its primary use for surveillance and observation in battlefield environments with downlinked video. Other implementations and uses include target designation and as a training target. The Pchela is launched using rocket assist by two solid propellant booster rocket engines, and it is recovered via parachute.The Pchela-1T has a range 60 km (37mi), flies at 100-2500m (328-8,203ft) altitude at 120-180km/h (75-112mph).